How can chromosomes become damaged? Chromosomes can become damaged physically (in their appearance) and molecularly (in the specific DNA sequences they contain). Chromosomes can break randomly or due to exposure to ionizing radiation, which acts like a miniature cannonball, blasting the strands of DNA. Other factors such as physical trauma or chemical insult can also cause breaks. When a chromosome breaks, the broken part may then reattach to another chromosome, a process called translocation. Sometimes the broken chromosomes may attach to each other, forming a ring. Any type of chemical change is known as a mutation. 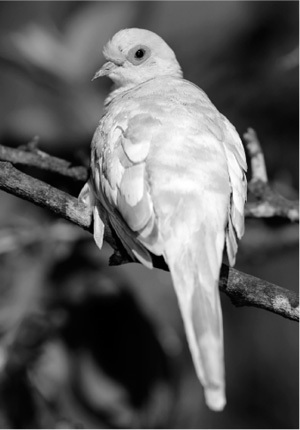 Most diamond doves are all white, but this dove has fawn-colored feathers due to a genetic mutation.